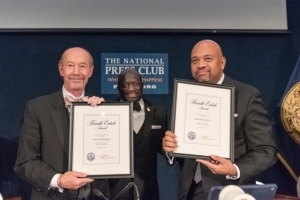 Sports journalists Tony Kornheiser (l) and Michael Wilbon (r) were presented with the National Press Club Fourth Estate  Award at a dinner on Wednesday, Oct. 4. Club President Jeff Ballou (c)  bestowed the Club's highest annual honor. Usually needling each other on their show, now in its 16th year, the two Washington Post sports section alums bore the brunt of good-natured roasting at the hands of former colleagues. Former Post sports editor George Solomon, who hired them both at the newspaper, noted that Kornheiser's columns in The New York Times "were pretty good if you read selected paragraphs." He told of the pair's frequent loud newsroom bickering, which prompted editors of other sections trying to work nearby to plead "Can't you get them to be quiet." The answer was always "no." Solomon conceded that having them around was "great for me, great for The Post, now great for ESPN and great for you." Accepting the 45th Fourth Estate Award, the Club's highest honor, Wilbon praised his print brethren, noting that The Washington Post and The New York Times enlighten people who don't necessarily want to be enlightened anymore. ESPN President John Skipper praised the pair for "remarkable chemistry" and "making sports fans smarter while being entertaining." Former Post Publisher Don Graham confessed -- tongue in cheek -- that he tried to get them to stay at the paper by telling them "newspapers are the future." The audience in the packed Club ballroom laughed knowingly. Journalist Emilio Gutierrez accepted on behalf of his colleagues in what Reporters Without Borders classifies as the deadliest country in the Western Hemisphere for the media. Through a translator, Gutierrez said he and his Mexican associates "find ourselves immersed in a great darkness," as reporters are killed, kidnapped and forced into hiding in retaliation for their reporting on drug cartels and government corruption. He also criticized mistreatment of Mexican reporters seeking asylum at the hands of U.S. immigration authorities while they wait for a decision on their requests. Gutierrez himself witnessed and reported on Mexican soldiers robbing immigrants in 2008  as they moved toward the border. In retaliation for his story, 50 soldiers invaded his home. He and his son escaped to the United States and sought asylum. They were kept in separate detention for seven months while the asylum case began its way through the courts. So far the request has been denied. Gutierrez is living in Las Cruces, New Mexico, while he appeals the denial. He has two appeals left. WHCA President Margaret Talev, in accepting the group's award, noted that the aggravation faced by White House reporters does not compare to the dangers confronting their Mexican counterparts, but said even in the United States, reporters can't take press freedom for granted. "It's been a little weird lately," Talev said. On a high note, she pointed out that when hurricanes or mass shootings occur, Americans still turn instinctively to the so-called mainstream media.